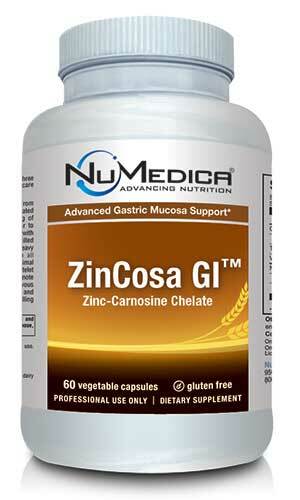 NuMedica ZinCosa GI is available in a easy-to-swallow vegetable capsule form to provide you with the essential element zinc to support and maintain the health of the mucosal lining of your gastro-intestinal tract. It's advanced cytoprotection formula is specifically designed to deliver effective protection to both in-tact and damaged areas of the gastric mucosa. 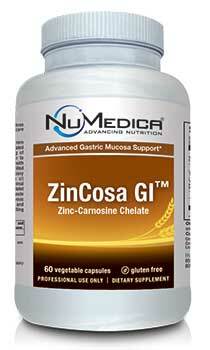 NuMedica ZinCosa GI zinc compounds are bound together in a balanced, 1:1 ratio using superior chelation technology. The resulting chelated Zinc-Carnosine compound has been shown to be three times more effective than zinc ions and l-Carnosine alone, making NuMedica ZinCosa GI a superior product when compared to non-chelated zinc carnosine formulations. Each NuMedica ZinCosa GI vegetable capsule is comprised of 17mg of zinc carnosine blended with 75mg of chelated zinc carnosine to offer enhanced protection against the unwanted absorption of unwanted, sensitizing proteins such as gluten and casein. Also known as an 'essential trace element', Zinc is a metal that is essential to human health and well-being. Zinc has been used to boost the immune system, combat the common cold and fight against invasive parasitic diseases such as malaria. Zinc deficiency has been positively linked to gastro-intestinal disorders such as chronic diarrhea, ulcerative colitis and Crohn's disease, as well as male infertility, high blood pressure and recurrent ear infections.